SaltStack automates management of data center infrastructure and applications for faster, easier DevOps. 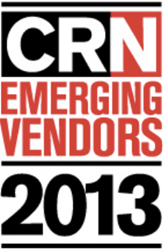 From a list of more than 225 emerging vendors, CRN selected SaltStack and 24 others as the coolest tech startups in 2013. SaltStack, the full automation stack for the Internet assembly line and any cloud, today announced CRN named the company one of the Top 25 Coolest Emerging Vendors for 2013 in the category of "data center." Each year, CRN looks at the hot IT startups making an impact on the channel and impressing the tech industry as a whole. This year, the Emerging Vendors for 2013 list includes startups that were established no earlier than 2007 across a number of technology categories. From a list of more than 225 emerging vendors, CRN selected SaltStack and 24 others as the coolest tech startups in 2013. SaltStack provides flexible, easy-to-use software for real-time infrastructure automation and application stack configuration management. SaltStack is known for its speed and its ability to scale unmodified to support environments with tens of thousands of systems with no performance or functional degradation. Marc Chenn, SaltStack CEO, said, “The tech industry, from consumer app startups to enterprise IT, are all running toward Web scale and big cloud. SaltStack is busy making the software that automates this Internet assembly line and is an excellent complement to the DevOps approach emerging from it. Our success in large part is due to a healthy and vibrant open source community, with its hundreds of developers, building an automation platform for the very unique needs of their modern data centers. SaltStack is used by systems administrators to provision, orchestrate and manage any physical, virtual or cloud environment. SaltStack is unique in providing enterprise software for remote system execution together with configuration management built specifically for modern data center infrastructures. SaltStack takes a common-sense approach to server infrastructure configuration and automation, is written in Python, utilizes easy to create and read YAML for configuration formulas, and works in a push or pull model with intelligent masters and minions for flexible, dynamic, real-time automation.